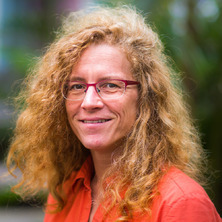 Stefanie was awarded a PhD in Cognitive Psychology / Experimental Psychology in 2007, from the University of Bielefeld, Germany, and was subsequently awarded two awards for it (amongst them the National German Dissertation Award). She then took up a 1-year post-doc position with Prof Roger Remington at UQ. Subsequently, her work was supported by various fellowships from UQ and the ARC, allowing Stefanie to focus mainly on research from 2009 - 2018. Afterwards she was employed on a Teaching and Research position at UQ, where she is currently employed as an Associate Professor. Can emotional factors such as happy or angry faces involuntarily attract our attention, possibly because angry faces may constitute a threat? In my lab, this question has been intensely studied, often with EEG or eye movements, and our research has shown that both perceptual factors such as saliency and emotional states such as our own mood can modulate attention to emotional faces. Visual search is one of the most frequent activities of everyday life, and often becomes quite frustrating when we cannot find our keys or phone. One of my core interests is to study the factors and mechanisms that drive visual search, and render it efficient or inefficient. Please see Projects at http://www.sibecker.com for further details. My research focus is broadly in the area of Cognitive Psychology and Neuroscience, and specifically, in attention research. My perhaps most important contribution to date is that I formulated a new relational theory of attention and eye movements (Becker, 2010; JEP-General). Deviating from the most prominent feature-specific theories of attention, my research shows that attention can be tuned in a highly context-dependent manner to objects, to select the reddest, darkest or largest object. There is also a long-standing debate whether attention is controlled by stimulus-driven factors that are outside of of our control or goal-driven factors such as our intentions. My own work shows that we indeed have a large amount of control over visual selective attention, as we can tune attention to sought-after objects which then quickly attract the gaze when they are present. There are however also bottom-up limitations to this goal-driven selection process that can completely frustrate our attempts to find an object. The findings are relevant, as conscious perception is severely capacity-limited: Attention selects objects for further processing and determines which items we can consciously appraise first. My own relational account has recently been extended to Inattentional Blindness, Awareness and Memory, allowing even more accurate predictions about what items we will consciously perceive first, and which we will miss. This has important implications about how we should design environments to ensure that important signals and signs capture our attention, and prevent that we miss them. Can the relational account of attention explain search in natural environments and inattentional blindness? Top-down modulation of oculomotor capture: The role of feature relationships in guiding visual attention. There are continuously a range of projects available in my lab to work on visual attention and/or eye movements. The exact topic is negotiated with students. PhD students will learn how to program experiments, analyse the data, present the results to the lab as well as at conferences, and write up the results for publication. The dissertation or PhD thesis usually consists of 3 research articles with 2-3 experiments each, a general introduction and general discussion. Students from my lab are encouraged to present their work at conferences nationally as well as overseas, and to visit other labs to further hone their skills. Guidance of attention by feature relationships: the end of the road for feature map theories? Which kind of attention is captured by cues with the relative target colour? Visual search for color and shape: when is the gaze guided by feature relationships, when by feature values? Determinants of dwell time in visual search: Similarity or perceptual difficulty? Can intertrial effects of features and dimensions be explained by a single theory? The mechanism of priming: Episodic retrieval or priming of pop-out? The stage of priming: Are intertrial repetition effects attentional or decisional? Irrelevant singletons in pop-out search: Attentional capture or filtering costs? Search for emotional schematic faces: What determines the search asymmetry for angry faces? Are visual attention and eye movements guided by relational information?